There are, not surprisingly, many variations on this classic dish. We like ours stripped down to its simplest form. Served with garlic crostini or fresh french baguette, this is an easy, healthy, weeknight meal. Pro tip: since mussels are alive when you buy them, get them out of the plastic bag as soon as possible. Store them in the fridge, in a shallow bowl covered with a damp towel until ready to use. The recipe below makes plenty for two people and the whole meal comes together in 10-15 minutes. In a medium saucepan or sauté pan over medium heat, melt 1T butter until foaming. Add shallots, 2 big pinches of salt, a couple of grinds of pepper and cook till softened. Add garlic and sauté until aromatic - about 30 seconds. Add wine and reduce until nearly dry - about 1 minute. Add stock with another pinch of salt and bring to simmer. Add mussels, cover pan and steam until opened - about 3-4 minutes - giving the pan a toss or shake midway through. 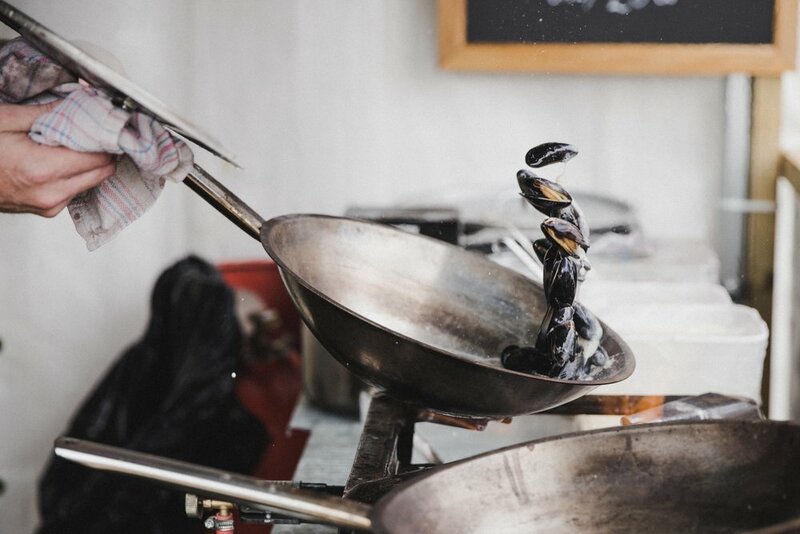 Using a spider, slotted spoon, or tongs, transfer the mussels directly from the pan into two serving bowls - leaving the broth. To the broth add the remaining 1T butter and parsley. Continue to simmer until butter has melted, swirling the pan as you do so. Taste and adjust with more salt or pepper if necessary. Spoon broth over mussels and serve with garlic crostini or crunchy french bread. Pour flour into a large bowl (or onto a clean countertop if so inclined) and make a well in the middle. Mix remaining ingredients in a small container and add to the well in the flour. Using a fork, gradually draw flour into egg mixture, stirring as you go. When dough is thick enough, turn out onto a clean surface dusted with plenty of left over flour from your bowl. Reserve any remaining flour from the bowl and begin to work into the dough – kneading as you go. When dough is no longer sticky stop adding flour and continue to knead until smooth (about 5 minutes). Wrap tightly in plastic and chill for at least 30 minutes. In a processor, pulse garlic with salt into paste. Add remaining ingredients – up to olive oil - and pulse until herbs break down. While processor is running, drizzle in olive oil. Taste and adjust with salt, pepper, and more lemon juice.